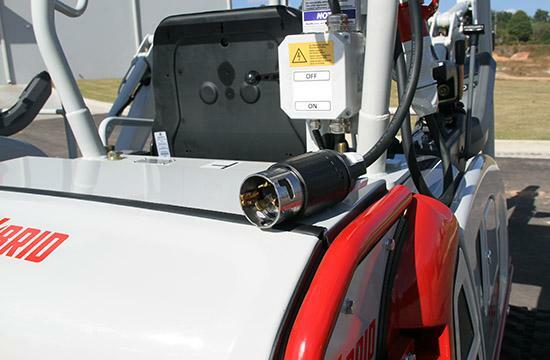 Offering state-of-the-art a wireless radio-control system, the IMER R19 provides you with fast and versatile handling. 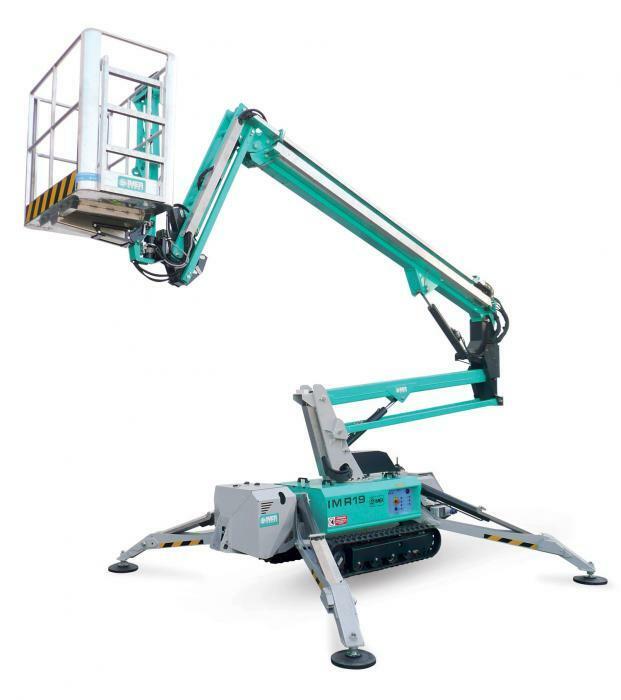 With traction and stability for building sites and rough terrain and automatic leveling, this spider excels at reaching the heights other can’t reach while maintaining a limited outrigger footprint. 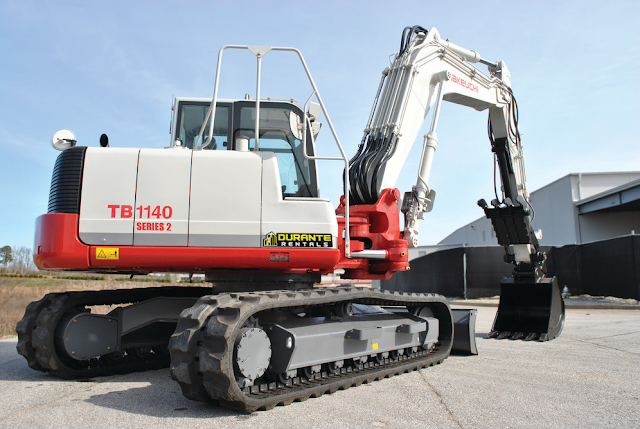 The compact size and dual power capabilities of the Takeuchi TB216H allow it to work in a wide range of applications that may have limited accessability and noise and clean air requirements. 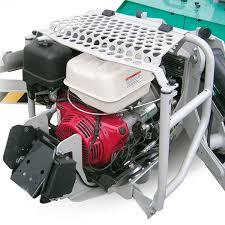 It is ideal for plumbing, landscaping, utility installation, interior demolition, and rental applications. Performance is identical between the diesel engine and electric motor, and the controls are the same regardless of operating mode. Bucket Breakout Force: 4,250 lbs. 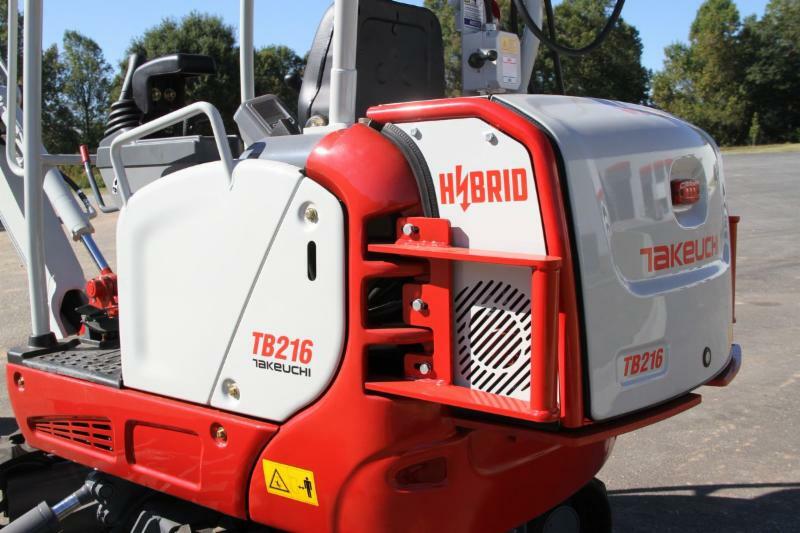 Watch the video to see the new Takeuchi TB216H Hybrid in action. Even the highest quality chainsaw will need to have the chain replaced eventually. Your chainsaw will only function properly if fitted with the proper chain. So how do you decide which chain fits your chainsaw? These numbers can usually be found printed at the base of the chainsaw's bar. For the saw pictured to the left, the bar length would be 24”/60cm; the pitch would be 3/8”; the gauge would be .050”; and it has a total of 84 drive links (DL). Some older chainsaws may not have these numbers printed on their bar or perhaps the numbers have worn out over time. 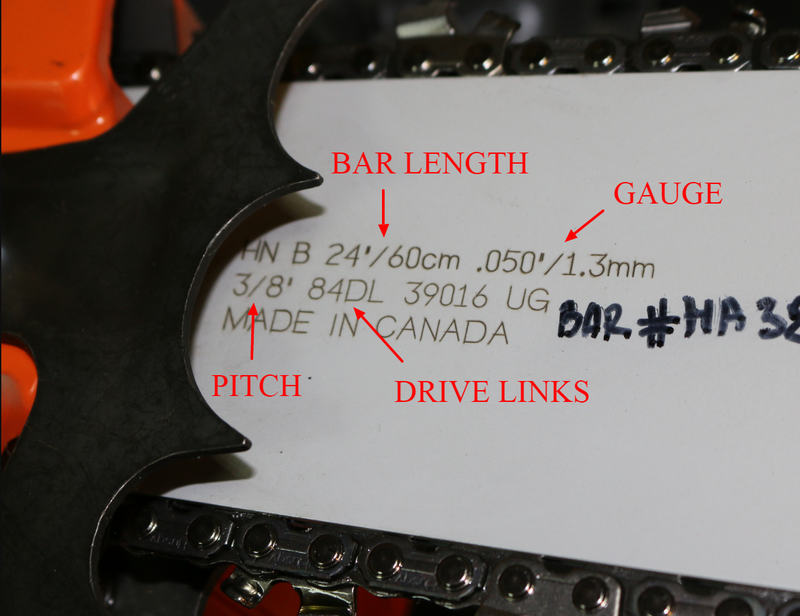 In these cases, you can find your bar length, pitch, gauge, and number of drive lengths by using the guidelines below. You can also take your chainsaw to your local dealer. You can find this number by measuring the length of the bar from the front of the chainsaw base to the farthest point on the cutting side of the bar. The “bar length” is always rounded to the nearest inch. Note: The bar length should be calculated from the main body of the chainsaw to the tip of the bar, not from the base of the bar itself which sits inside your chainsaw frame. 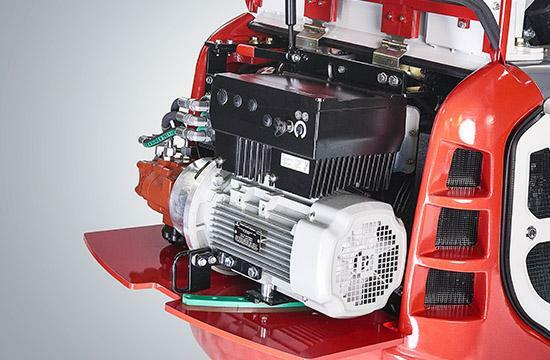 Pitch is the distance between your chainsaw’s drive links. Drive links are the small metal pieces sticking inwards on your blade that fit into your bar. Simply take a ruler and measure the distance from the center of one rivet to the center of the second rivet adjacent to it and divide by two. This simple calculation will give you your pitch. 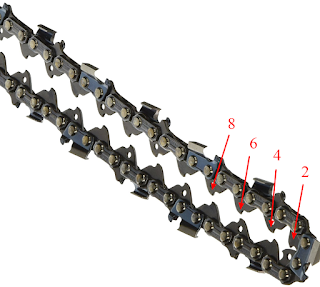 To ensure you've chosen the right chainsaw chain, count the number of drive links on the chain. The easiest way to count them is to set up your chain so that the drive lengths are aligned. You can then count them easily, two at a time, down the length of the chain. 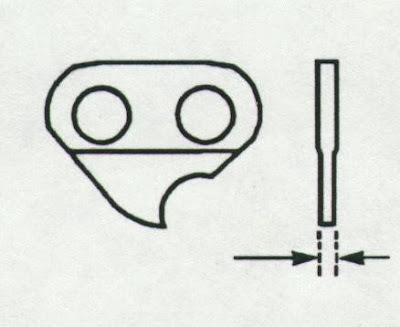 This number refers to the width of the groove in your chainsaw bar holding the drive links. One way to find this number is to measure your drive links with a tool called a caliper. If you don't have a caliper handy, start by cleaning one of the grooves using a knife or screwdriver. Then, try inserting a dime, a penny, and a quarter into the groove. The coin that fits snugly without forcing it will tell you the gauge. Once you your bar length, pitch, gauge, and drive number you are ready to buy your new chain. 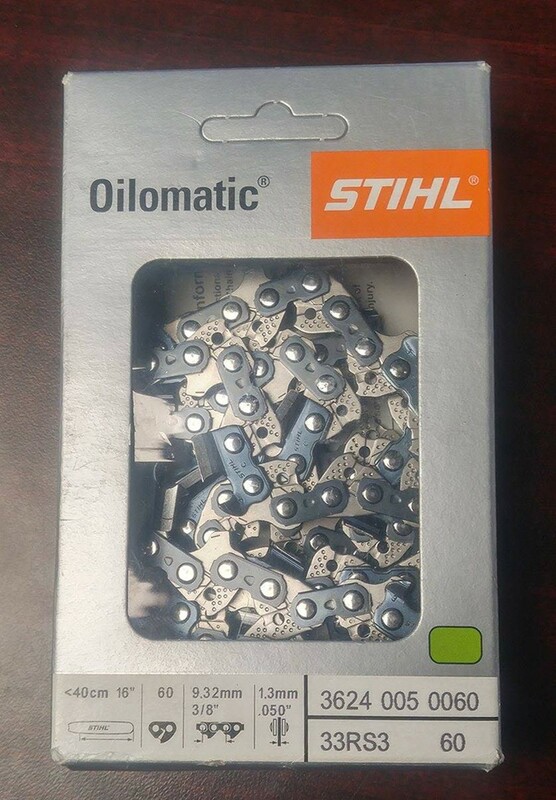 Most chains will have the numbers clearly labeled somewhere on the packaging (see below). Chains come in various models and tooth options but if the numbers on the chain match the numbers you worked out for your chainsaw, you now have the right chainsaw chain and you're ready to get to work. To purchase a new chainsaw chain, chainsaw accessories, or a new chainsaw, please visit DuranteRentals.com or call 1-800-DURANTE today! "The key to achieving optimal results in construction is to choose the right equipment and protect it with regular maintenance and care," said Jesse Pettit of Durante Rentals. Jesse points out, "New tracks can retail anywhere from $1,000 to $3,000 so it is important to keep your project in mind when choosing excavator tracks." Always consider the environment you will be working in. Firmer ground like hard packed soil or rocky terrain calls for a narrower track width or “shoe width”. 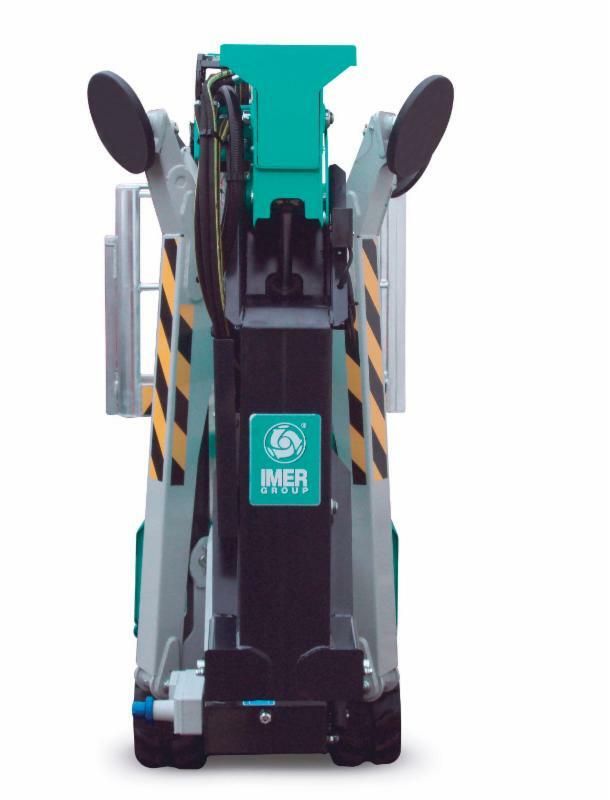 However, muddy or soft ground will require a wider shoe width for even weight distribution and to keep your machine from sinking. Drive smarter and extend the life of your tracks. Avoid driving over chemicals, salt, oil, etc. Keeping these best-practices in mind will help prevent undue stress on your machine while extending the life of your tracks. “Tracks should be cleaned of dirt and debris with a track spade or power washer after each use. If you skip this quick step, debris sitting on your tracks can eventually cause premature wear. After enough dirt accumulates, the added weight can also negatively effect your gas mileage. In the winter, frozen dirt can rub on the bolts, loosen the guiding and seize the rollers. When our rental machines come back, the first thing we do is make sure they are thoroughly cleaned,” says Jesse. 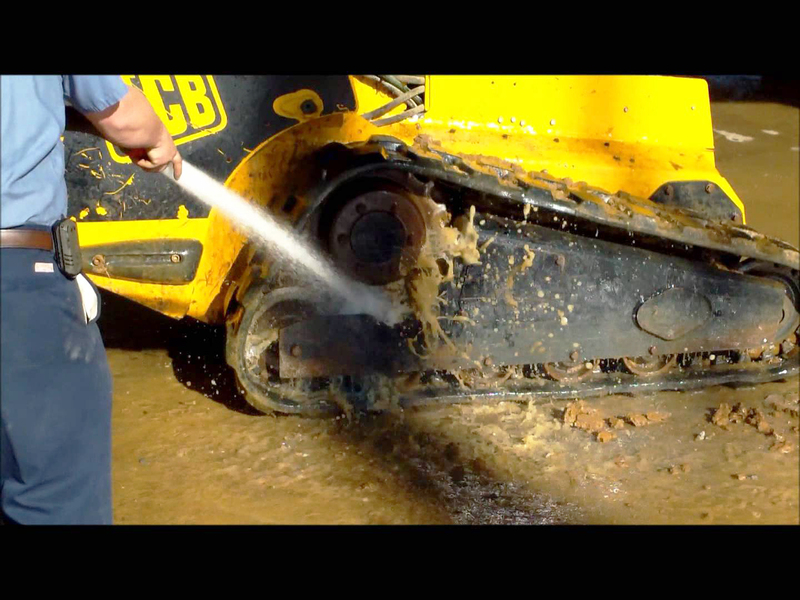 Regularly check the undercarriage of your machine for wear and tear. Worn sprockets, oil leaks, projecting bolts, or worn out rollers can seriously damage your tracks. Small cuts in a track will have little effect, but serious cuts/cracks can reflect damage to the cords. A deep cut will allow moisture into your cords, seriously shortening the life of your tracks. Make sure to check track tension regularly. 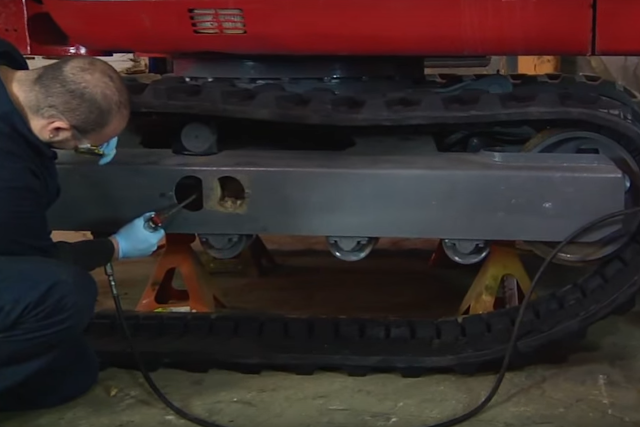 Loose tracks can damage your undercarriage and cause your tracks to slip off your machine while overly tight tracks can lead to serious performance issues. Try not to store your tracks in direct sunlight over long periods of time. Ideally, tracks should be stored in a dry, cool environment. If you know you your machine will be sitting for a while, make sure you take it for a spin every two weeks or so to prevent the tracks from warping. "Be careful if installing new tracks yourself. Better yet, have a professional do it for you," says Jesse. Improper installation can damage your rollers or crack the track. If you still think you'd rather do it yourself, make sure you wear the correct safety gear, including boots, gloves, and safety glasses. As always, it’s best practice to take a few moments and familiarize yourself with both the operators and service manuals. TECH TIP: Always replace both tracks simultaneously. Matching worn components with new components can considerably shorten their lifespan. For questions, or to learn about what kind of excavator is right for you, call 1-800-DURANTE or check our mini excavator page here.